I am biased when asked about my favorite hotels in Manila. I only have two answers - Edsa Shangri-La Hotel because that's where John and held our wedding reception in 2000, and The Legend Villas. Although smaller than Shang, Legend became a venue for many of my most memorable intimate events since 2010. Last March 29 to 30, I was invited for a family staycation at F1 Hotel Manila. I welcome and appreciate the invite but I was not very excited as I've visited the place more than five times when I covered previous events. I already saw their function rooms and in my mind it was just another new building at The Fort. My first impression of F1 changed upon entry to the lobby, located at the 5th floor. The lobby has very nice architectural lines and has a modern zen feel to it. It is simple yet captivating. I asked Pau (F1's Marketing Coordinator) why the hotel is called F1. He said, "because it is the first ever premier hotel built at The Fort, plus F1 is owned and managed by Filipinos. Located at the 3rd level of the hotel is an all-day dining restaurant called “F” which serves both ala carte and buffet. We had a wonderful time as we met Chef Sau Del Rosario (F1's Executive Chef). Friendly and famous bloggers and their respective families made us all comfortable though it was our first time to meet most of them. Special mention goes to Spanky Enriquez of Juice.ph, Richie Zamora of The Pickiest Eater, Micko Maiquez and the whole F1 Hotel Manila family for the happy experiences you provided. Household chores and business matters takes its toll on any family. Going out on a family bonding is necessary to rekindle that "fire". At F1, John and I slept soundly while Julia, Rafael and Juan enjoyed swimming with Maizi and Jill. Don't just take my word, better visit F1 Hotel Manila and experience fun activities lined up this April, namely Luscious Lent, Easter in Space, Holy Week Reel Deal and Merienda Cena. 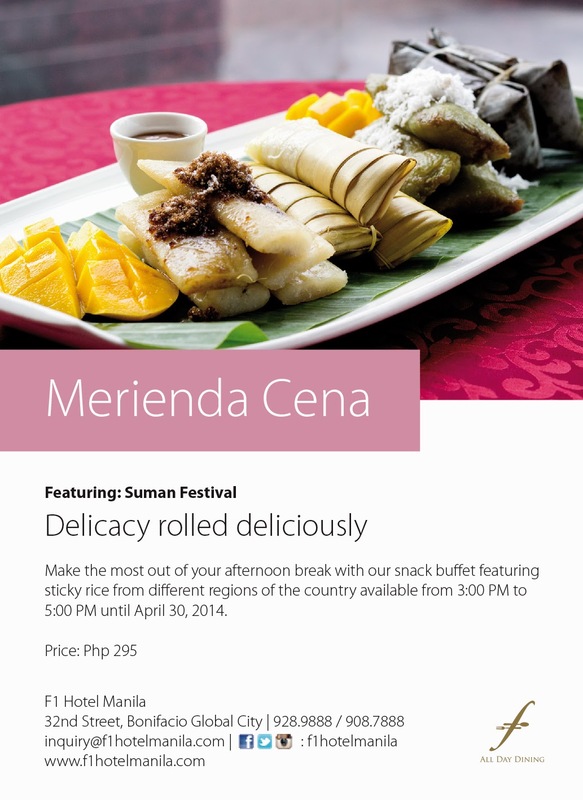 Commemorate this Lenten Season in a more tasteful way, dine in with the humble entrées prepared by seasoned chefs without breaking the culture of fasting and abstinence. 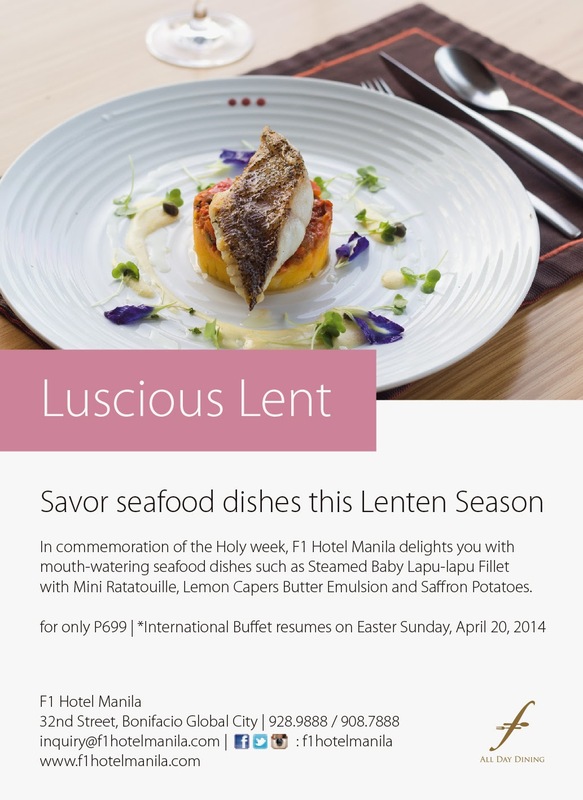 You can keep the religious tradition and still enjoy the mouth-watering offers made just for Lent. Treat yourself with an array of a la carte seafood dishes such as Steamed Baby Lapu-lapu Fillet with Mini Ratatouille; Lemon Capers Butter Emulsion and Saffron Potatoes cooked to perfection. Expect a very one of a kind Easter at your home of happy experiences. 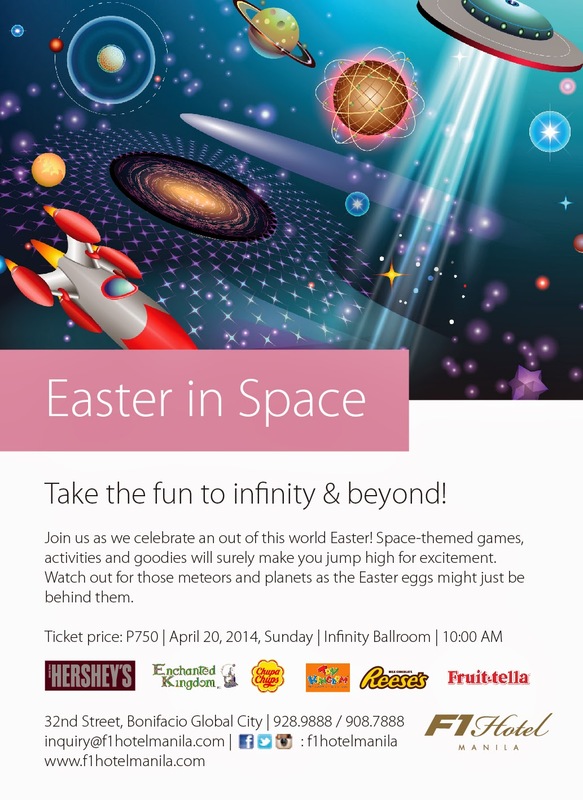 Tons of laughter and fun will take place with Easter in Space event. Sky is the limit in finding those cosmetic eggs. Watch out for those meteors and planets as Easter eggs might just be behind them. Spaced-themed games and activities also await your kids at the Infinity Ballroom. To top it all, they will all be given goodies from Toy Kingdom, Enchanted Kingdom, Fruittella, Chupa Chups, Hershey’s, San Miguel Corporation and Manila Bulletin. After dining some of our appetizing offers, there’s nothing more unique than watching movies under the naked sky. 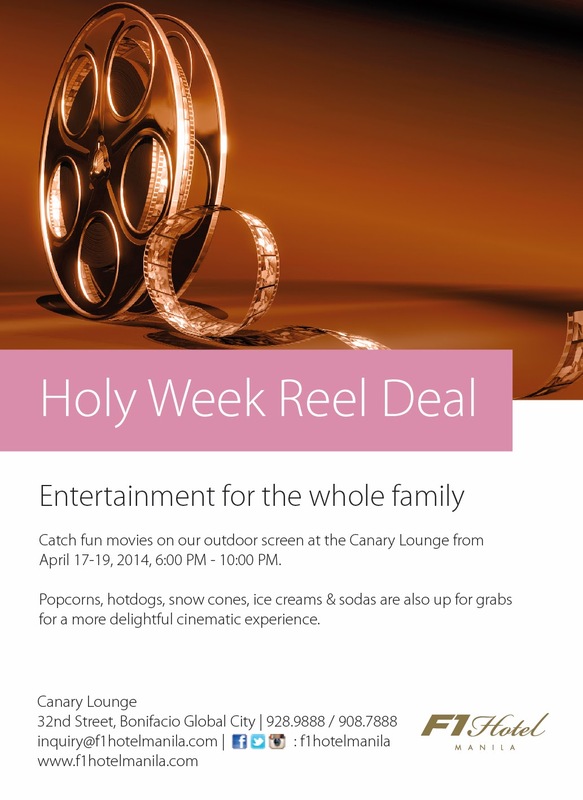 Feel the cold breeze of the night and relax under the shimmering stars while watching fun and family-oriented movies. Get a nightly dose of values and life lessons you will surely ponder on. For the kids and kids at heart, popcorns, hotdogs, snow cones, ice creams and sodas are also up for grabs. It was such a lovely weekend and we enjoyed it so much and gained a few pounds. I just discovered it today. I missed the night at Canary Lounge. :( but I enjoyed the spa, haha.